In English Casserole has evolved to mean a wide, straight sided pot with a close fitting lid and ear-like side handles. It has also come to describe the method of cooking which produces a rich stew of meat and vegetables and to achieve this it is important to give some thought to the type of casserole you choose to buy. Casseroles can be made of a variety of materials including cast iron, ceramic, stainless steel and heavy duty metal with reinforced non-stick coatings. Generally the heavier it is the better, as the meat needs to be browned quickly at a high heat on the hob at the start of cooking, followed by a long and slow process to continue cooking the stew at a very low heat either on the hob or in the oven. If the casserole is made of a thin poor quality material it will be difficult to keep it at a low heat without burning, unnecessary heat loss, or undesired rapid evaporation. A thick pot with a heavy base will ensure that the heat is slowly absorbed, retained and evenly transmitted to the contents so that the food at the top of the pot is cooked just as thoroughly as the food at the bottom. 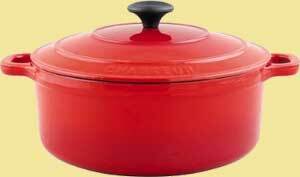 Round casseroles tend to be used for cooking stews and ragouts, with oval pans for pot-roasts and braising. 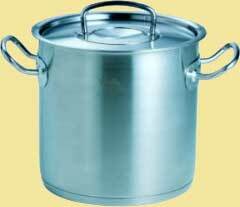 Stockpots are essential for anyone who enjoys making good quality soup, and indeed stocks, for a variety of other recipes. The choice of material tends to be the same as for casseroles but the design is rather different. Stockpots have higher sides and tend towards a narrow shape which slows evaporation of liquid and allows the solids (bones or vegetables) to remain submerged for hours at a time, so as to get the best flavour out of them for the stock. Some manufacturers produce stockpots with pasta inserts which lift out easily leaving the water behind, and can double up as a strainer for blanching vegetables.